An airport price war is expected as Eurostar launch a new service to Amsterdam. The first ever direct train ran to the Dutch capital today. Some of the biggest engineering projects get underway on the region's railway over Christmas, as Southern Rail and airport staff strike. British Airways has announced it will run a full schedule on Christmas Day and Boxing Day despite its cabin crew's threatened industrial action. In a statement on its website, the airline said it "remains fully committed to finding a solution to this issue", saying it had "spent the weekend reviewing our contingency plans". Hundreds of thousands face a week of travel misery as rail, airport and postal strikes hit the south. Southampton Airport is to charge a £1 dropping-off fee for passengers near the main terminal. Army medics are, tonight, preparing to travel to West Africa - to join efforts to stop the deadly Ebola virus spreading. Teams from Aldershot have been practising in a 'mock' hospital unit to prepare themselves - or at least try to prepare - for what lies ahead in Sierra Leone. 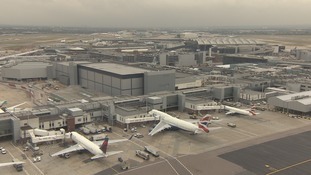 Heathrow and Gatwick airports are getting ready to screen passengers arriving from areas affected by the disease. Juliette Fletcher has been speaking to families waiting anxiously for news of relatives - and to the fundraisers who want to help.